Indiana Ordnance Works, 1940s, Image courtesy of Hagley Digital Archives. 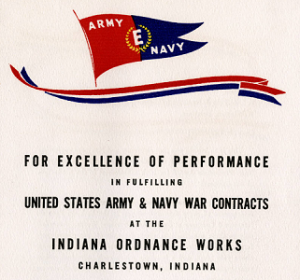 The Indiana Historical Bureau recently completed research and marker text for the massive WWII smokeless powder plant in Charlestown, Indiana known as the Indiana Army Ammunition Plant. 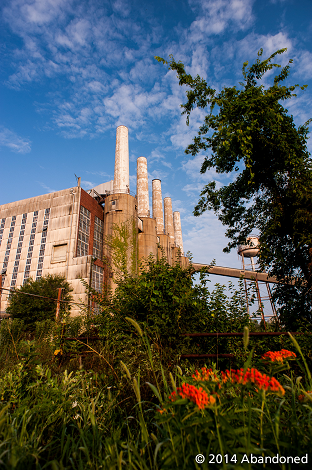 The plant received multiple military awards for production, transformed the local community and bolstered its economy, and provided job opportunities for women and African Americans. This historical marker helps fill a void in the State Historical Marker Collection by commemorating Indiana’s WWII home front and the contributions of Hoosier men and women to the war effort. At the outbreak of war in Europe in September 1939, the Allied Powers desperately needed war supplies to combat Germany’s war resources, as the country had been producing material since the early 1930s. In response, the U.S. established an extensive ordnance system, hoping in part to stave off their own involvement in war. The Evacuation of Dunkirk in May 1940 and Fall of France in June greatly hastened U.S. efforts to construct ordnance plants and resulted in the establishment of the smokeless powder plant in Charlestown. Smokeless powder was crucial to combat because traditional smoke obscured combatants’ vision and revealed their location. Smokeless powder, made from colloided nitrocellulose, acted as the primary explosive propellant for various war ammunition. 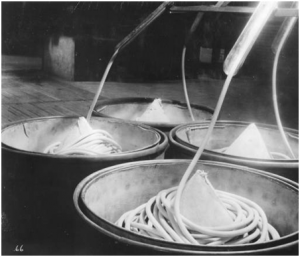 Cords of smokeless powder before being cut into appropriate sizes, 1940s, Image courtesy of Hagley Digital Archives. Steve Gaither and Kimberly L. Kane contend in their comprehensive 1995 study, The World War II Ordnance Department’s Government-Owned (GOCO) Industrial Facilities: Indiana Army Ammunition Plant Historic Investigation, that the smokeless powder plant in Charlestown, referred to as the Indiana Ordnance Works 1 (IOW1), was one of the first ordnance plants in the nation established to meet WWII war material needs. 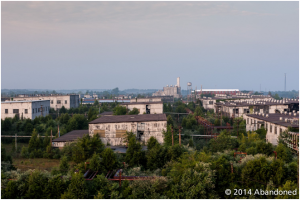 The southern Indiana town of 939 residents was chosen as the plant site because of its inexpensive land, ready labor force, close proximity to railroads, massive water supply provided by the Ohio River and removal from the country’s borders to avoid bombing or invasion. Former Charlestown resident Mary T. Hughes described Charlestown to the Indianapolis Times in November 1940 as a “quiet, easy going upland town-one of those southern Indiana towns where rambling homes line the shaded streets and the still peace of the afternoon is like Sunday.” Walter A. Shead similarly profiled the town in a December 1940 Madison [IN] Courier article, stating that Charlestown “has watched the years slip past through the century without even the quickening of a pulse-beat . . . most of whom are retired farmers, has lived the simple life undisturbed by modern conveniences or the quickened tempo of present-day life.” Unsurprisingly, the influx of thousands of workers and rapid industrialization shocked the small town. Shortly after Congress passed funding for munitions production on July 1, 1940, the federal government awarded E.I. deNemours DuPont Co. a war contract to establish IOW1. 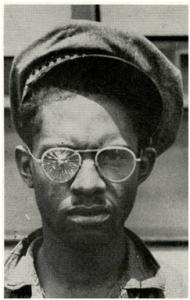 The arrangement, known as a Government-Owned Contractor-Operated (GOCO) collaboration, was undertaken frequently in WWII. 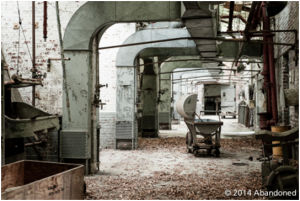 In GOCO collaborations, the federal government owned the ordnance plant and a business experienced in mass production was responsible for plant design, construction and operations. Soon after DuPont was awarded the contract, agents arrived in Charlestown to purchase properties including businesses, churches, farms and private residences to build the plant, affording local residents unheard of economic opportunities. Purchased house, Indiana Ordnance Works Real Estate Acquisition 1941, Charlestown, Indiana, Image courtesy of Indiana Memory Digital Collections. 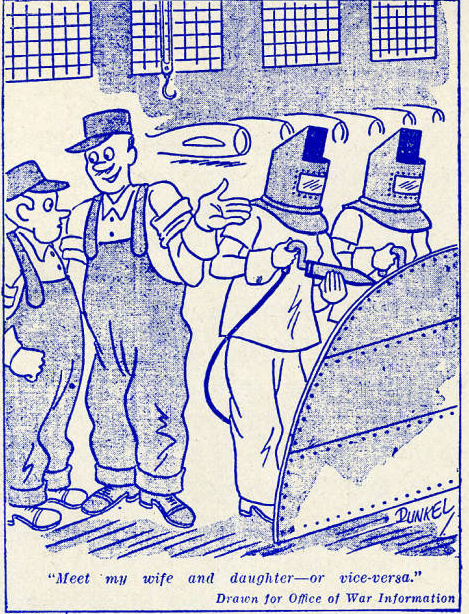 In addition to the smokeless powder plant, the federal government worked with the Goodyear Tire and Rubber Company in early 1941 to establish a bag-loading plant known as the Hoosier Ordnance Plant (HOP). HOP workers weighed, assembled and packed smokeless powder into silk bags. HOP, along with an uncompleted double-base rocket powder plant, Indiana Ordnance Works 2 (IOW2), drew thousands of construction and production workers to the area. 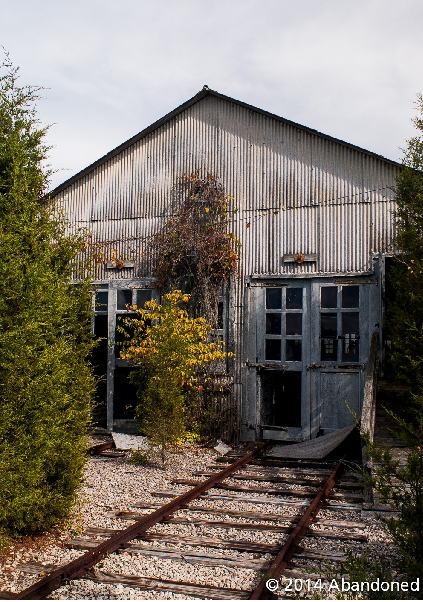 Mixer House Building 208, 2014, Image courtesy of Abandoned Online. Another immediate problem facing Charlestown was the town’s lack of rudimentary sanitation systems. 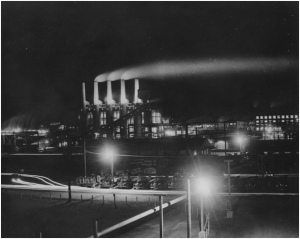 According to a 1942 public health survey, prior to the plants’ establishment the town had no systematic trash or human waste disposal program. Additionally, Charlestown lacked a public water supply, depending primarily on private wells and cisterns. The absence of sanitary accommodations caused residents and officials to worry about epidemics. The 1942 survey reported “The dangers to health flowing from a congestion of workers drawn from north and south and east and west, eating and sleeping under the most elementary conditions, crowded into inadequate quarters and served by water, milk, and sanitary facilities designed for a small community can hardly be exaggerated.” The establishment of trailer camps, accommodating hundreds of workers and their families in close proximity, worsened these fears. Conditions proved so precarious that even the town jail was condemned and closed by the State Board of Institutions for sanitation reasons. Charlestown, 2014, Image courtesy of Abandoned Online. The overcrowding of local businesses, infrastructure and sanitation facilities generated tension between local residents and transient workers regarding who should shoulder the burden. A Madison [IN] Courier article explained that “Native folks in Charlestown are a little dazed, for they hardly know just what to make of this hub-bub which has come to shake the even tenor of their ways, a manner of life which has endured for more than a century.” Locals often labeled newcomers “du Ponters” and their children as “powder children” in an effort to differentiate themselves. 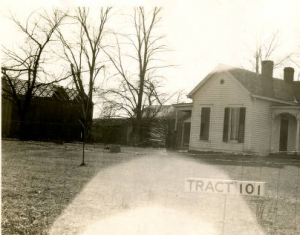 Conversely, Margaret Christie reported in the Indianapolis Star that many migrant workers resented the implication that locals considered them “’trailer trash.” Debates between local residents and transient workers played out publicly in letters to editors of local newspapers. For the most part, however, locals adjusted to the influx of transients and Charlestown permanently benefited from their patronage. 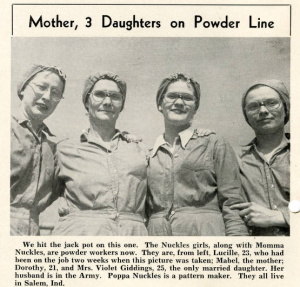 Check out Part II to learn about how the ordnance facility led to permanent improvement of the town, the use of German POWs, and how the plants ushered women and African Americans into the WWII labor force. See part one, Ambrose Bierce: The Evanescent Man, to learn about Ambrose Bierce’s early life in Indiana and how the Civil War influenced his literary work. 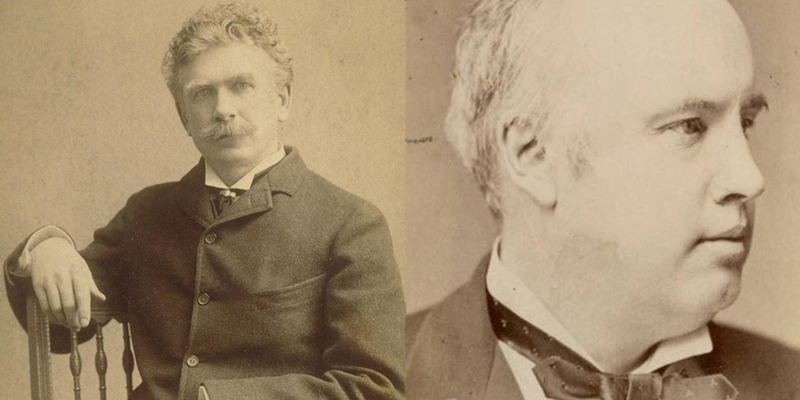 Ambrose Bierce (Left) had an intellectual kinship with the orator and freethinker Robert Green Ingersoll (Right). Images courtesy of Bancroft Library, University of California, Berkeley and Indiana Memory. While Bierce’s journalism and short stories garnered serious acclaim, his outspoken views on religion often made him notorious. Bierce’s own agnosticism aligned with another iconoclast of the period: Robert Green Ingersoll. 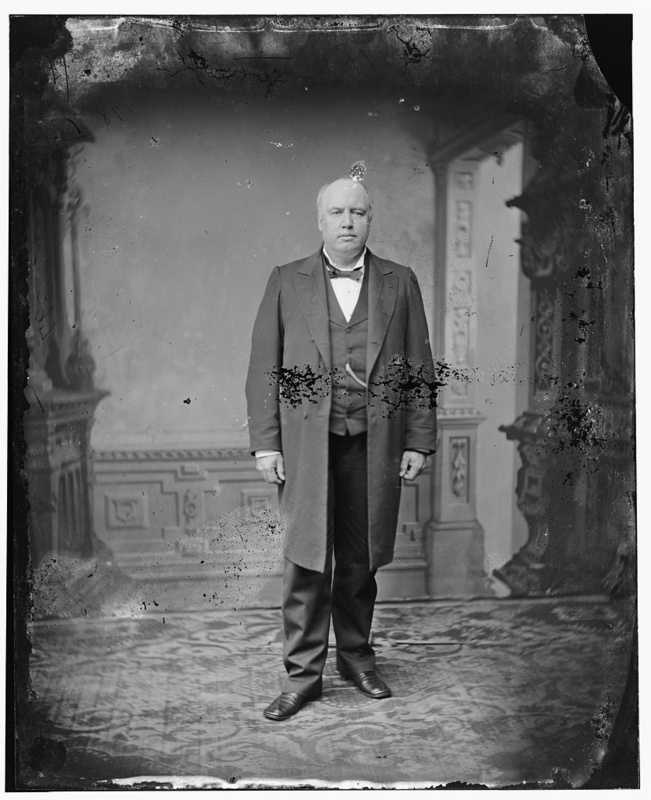 Known as the “Great Agnostic,” Ingersoll was an Illinois politician and lawyer who had a lucrative career in oratory. He gave sold-out speeches all across the country, including Indiana, that were critical of religion, Christianity, and superstition. While there is no evidence to suggest that he and Bierce met, their paths crossed numerous times in literary endeavors and their counter-cultural thinking became an indelible part of 19th century Freethought (broadly understood during the period as an open, reasoned evaluation of religion and spirituality). Robert Green Ingersoll was one of the best known freethinkers of his era. His views on religion and spirituality often mirrored Bierce’s ideas. Image courtesy of the Library of Congress. Of Ingersoll’s own wit, Bierce argued that it was, “keen, bright, and clean as an Arab’s scimitar.” While his pessimism may have rankled Ingersoll’s more utopian proclivities, Bierce’s essay does show a deep intellectual kinship between the two. 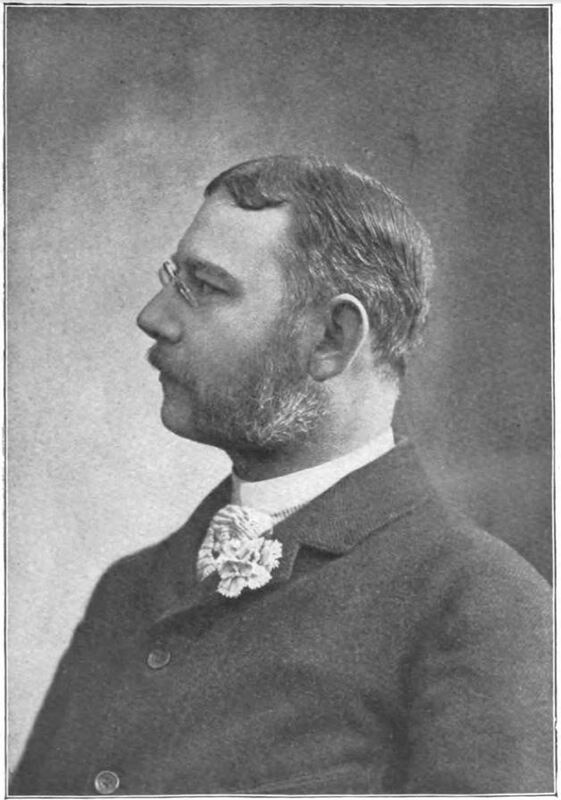 Literature scholar Harry Thurston Peck was a vocal critic of Robert Ingersoll. 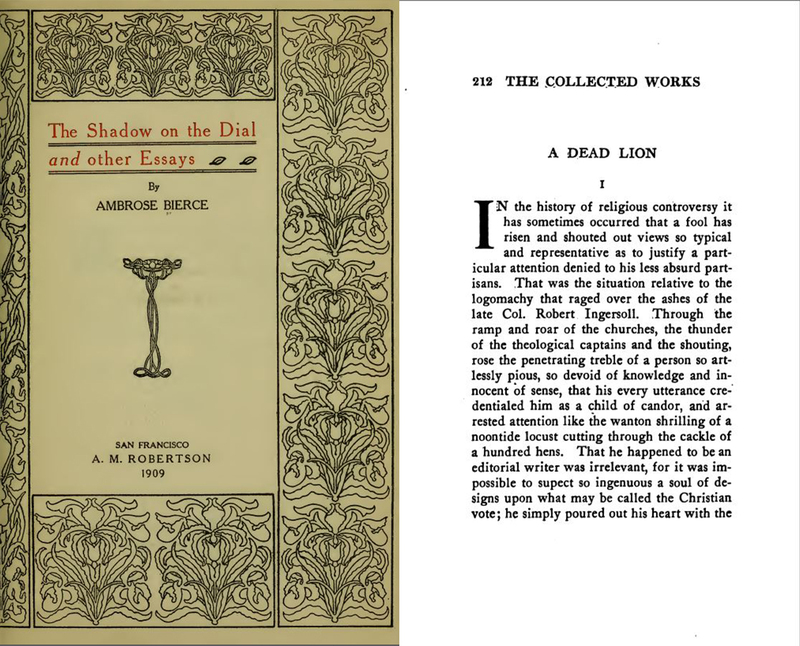 Bierce responded to Peck’s criticism of the Great Agnostic in his essay, “A Dead Lion.” Image courtesy of Internet Archive. It was Robert G. Ingersoll’s opinion that there is rather too little than too much suicide in the world—that people are so cowardly as to live on after endurance has ceased to be a virtue. This view is but a return to the wisdom of the ancients, in whose splendid civilization suicide had as honorable place as any other courageous, reasonable, and unselfish act. Both Ingersoll and Bierce’s essays reflected a secular, humanistic view of ethics, one that divorces human actions and contexts from the religious beliefs of the past. In some respects, this put both men quite ahead of their time. “A Dead Lion” (Right) displayed Bierce’s respect for Robert Ingersoll’s views. His essay on suicide , “The Right to Take Oneself Off,” appeared in The Shadow of the Dial and Other Essays (Left). Images courtesy of Internet Archive. Bierce also held irreverent views on life after death. In an essay entitled “Not All Men Desire Immortality,” Bierce decries the spiritualism of his time, albeit with clever quips such as: “If we have among us one who can put over a blaze by looking at it, the matter may not have any visible bearing on the question of life after death, but it is of the liveliest interest to the Fire Department.” Bierce contemplated questions of the afterlife and spirituality as a skeptic, noting that they are “still as much a matter of faith as ever it was.” In other words, he had to see it to believe it. Above all else, the lasting legacy of Ambrose Bierce’s free thought and connection to Ingersoll is arguably The Devil’s Dictionary, published in 1911. 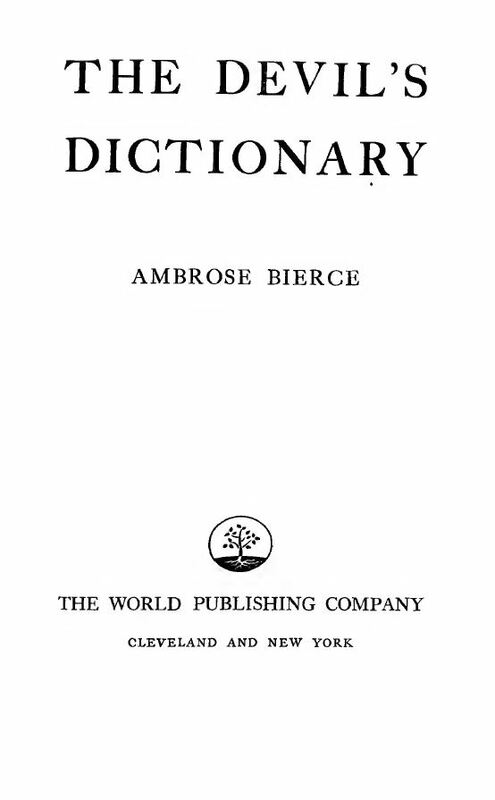 Originally released as The Cynic’s Word Book in 1906, The Devil’s Dictionary displays Bierce’s heretical nature in economical, but clever definitions. Some entries in his lexicon include, “Apostate: A leech who, having penetrated the shell of a turtle only to find that the creature has long been dead, deems it expedient to form a new attachment to a fresh turtle,” and, “Clergyman: A man who undertakes the management of our spiritual affairs as a method of bettering our temporal ones.” He would often include poems or short story fragments with his definitions, with funny pseudonyms like “Father Gassalasca Jape” and “Booley Fito.” Selected entries also appeared in newspapers throughout the country, and its controversial definitions even inspired critical lectures by clergymen. This work influenced journalist and fellow iconoclast H. L. Mencken, who wrote clever “definitions” in his own columns and newspapers. The Devil’s Dictionary, published in 1911, displays Bierce’s wit and sardonic humor about life, society, and religion. 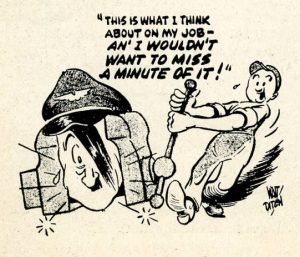 Image courtesy of Internet Archive. Ambrose Bierce’s life and literary work speaks to an era of “lost souls,” men whose lives were shaped, or shattered, by the Civil War. Some veterans discovered interests in the spiritual, like Ben-Hur author and fellow Hoosier Lew Wallace. Others, like Bierce and Ingersoll, saw it as their life’s mission to destroy myths and comfortable illusions that crept through their society like a plague. Gifted with the power of prose, Bierce’s incisive and often tragically-hilarious writings showcase a man deeply in-synch with his own convictions. Bierce never believed in a personal immortality, but his writing’s enduring appeal has given him an immortality he may have never imagined. Ambrose Bierce by J.H.E. Partington. Courtesy of Library of Congress. The history of American letters overflows with stories of eccentric characters, both from the pages and their authors. One particular author whose unique view of the world shaped his writings and his lifestyle was Hoosier Ambrose Bierce. Like Mark Twain, Bierce is usually associated with the San Francisco writing scene of the late-19th century. However, he spent many of his formative years in Indiana, learning about the newspaper business and ultimately enlisting in the Civil War. These early experiences not only shaped his incomparable writing style, but they influenced his distinctive views about life and religion. Ambrose Gwinnett Bierce was born June 24, 1842 in Horse Cave Creek, Ohio. Bierce’s early life, after he and his family moved to Indiana, remains shrouded in mystery. Some sources indicate that the Bierce family moved to Kosciusko County in 1846, but it is hard to verify. Bierce reportedly lived on the family’s settlement in Walnut Creek until he was 15, when he moved to Warsaw to work as a “printer’s devil” (an apprentice tasked with multiple duties) for the Republican newspaper, the Northern Indianan. Reportedly, Bierce also traveled to Kentucky in 1859-60, learning typography at the Kentucky Military Institute. After returning from Kentucky, Bierce reportedly lived in Elkhart from 1860-1861. 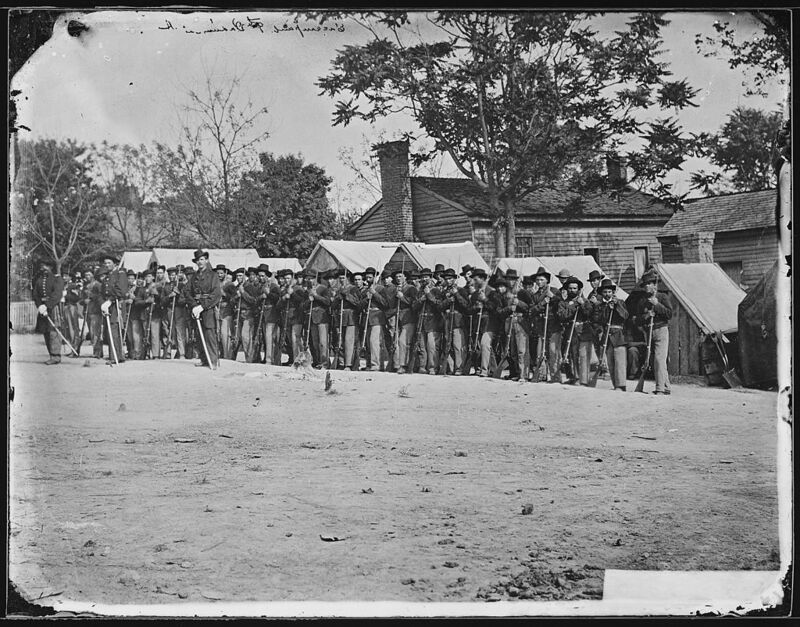 At the outbreak of the Civil War, Bierce enlisted in Company C of the Ninth Indiana Regiment in April 1861 and served as a private for three months. He was promoted to Sergeant in July 1861, when he reenlisted for a three year term. His upgrade in rank came as a result of his valor during the Battle of Laurel Hill on July 10, 1861. He was wounded at Kennesaw Mountain in 1864 and eventually opted not to reenlist, mustering out in January 1865 with the rank of First Lieutenant. Bierce’s intense and often painful experiences during his service in the Civil War inspired much of his literary work, particularly his short fiction and journalism. Company A, 9th Indiana Infantry. Photograph by Matthew Brady. Courtesy of U .S. National Archives and Records Administration. Bierce’s columns appeared in English and American newspapers. Bierce also published three collected humor works while in Great Britain; his most successful was Cobwebs from an Empty Skull, published in 1873. Prominent advertisements and reviews in This Week’s News and Lloyd’s Weekly London Newspaper solidified their modest success. 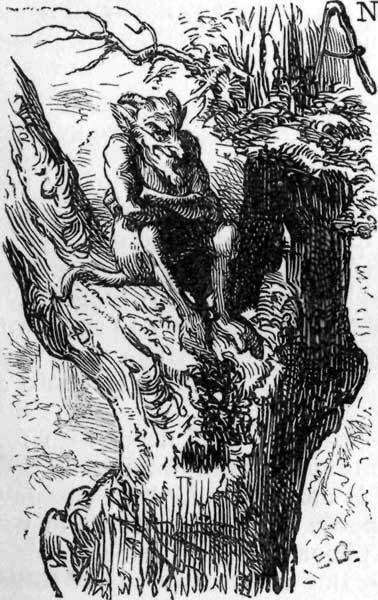 A lithograph of the devil from Cobwebs from an Empty Skull. Courtesy of Internet Archive. There is a man in San Francisco—a millionaire who has revived a very ancient custom, I am told. This gentleman is rather fond of dining people at his house—mostly men. Between the courses, now and then during the meal, he introduces various uncouth monsters, whose antics are supposed to amuse and edify the guests. I am told they don’t. A friend of mine has asked me to complain of the infliction—which I willingly do, although it is not the simplest method of relief that my friend could have thought out. If he does not relish monsters with his dinner why does he not dine at home and ask to have the monsters sent over to him afterward, as a separate entertainment? By 1898, Bierce renamed his column “War Topics” and wrote mostly of his early support and subsequent ambivalence regarding the Spanish-American War. In 1887, he worked for newspaper magnate William Randolph Hearst at the San Francisco Examiner. Like in Britain, Bierce’s columns were nationally syndicated, in outlets like the Wichita Eagle, The Louisiana Democrat, and the Washington Herald. Even though Hearst gave Bierce nearly complete editorial freedom, a growing antagonism existed between them. This may have been due to Bierce’s disgust with some of Hearst’s other journalists, specifically after 1906. Bierce formally left the employ of Hearst in March of 1909 to focus on compiling his collected works and memoirs. In 1891, he compiled many of his Civil War tales into Tales of Soldiers and Civilians. The book included “An Occurrence at Owl Creek Bridge,” which Hoosier satirist Kurt Vonnegut called the “greatest American Short Story.” The widely anthologized tale excellently displays Bierce’s style and grasp of the complexities of war. Film maker Robert Enrico adapted the story into an Academy Award winning short film (1963), which Rod Serling subsequently used as a Twilight Zone episode. Death is a dignitary who, when he comes announced, is to be received with formal manifestations of respect, even by those most familiar with him. In the code of military etiquette silence and fixity are forms of deference. 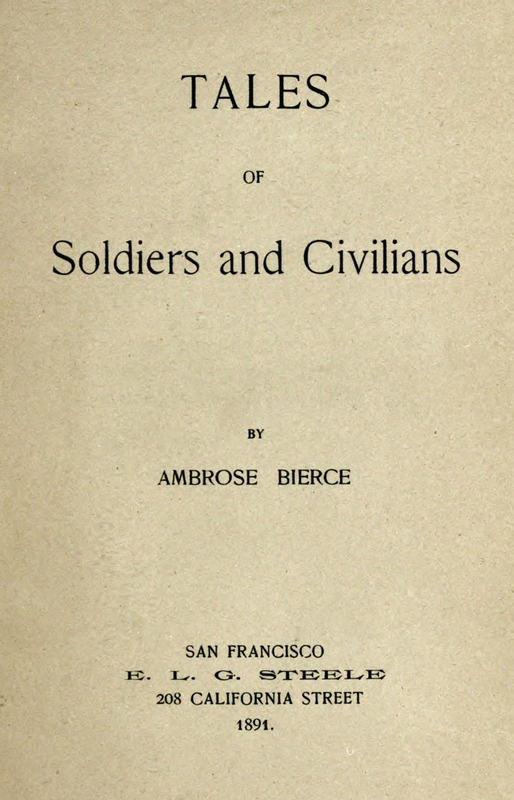 Title page of Tales of Soldiers and Civilians. Courtesy of Internet Archive. Based on the evidence of this last letter, Bierce possibly went to Mexico, but as investigator Joe Nickell notes, this supposed last letter attributed to Bierce, and preserved by his daughter, is probable at best. Therefore, it is more likely that he disappeared after 1914 and that the claim that he went to Mexico is plausible but not confirmed, based on his letters from late 1913. 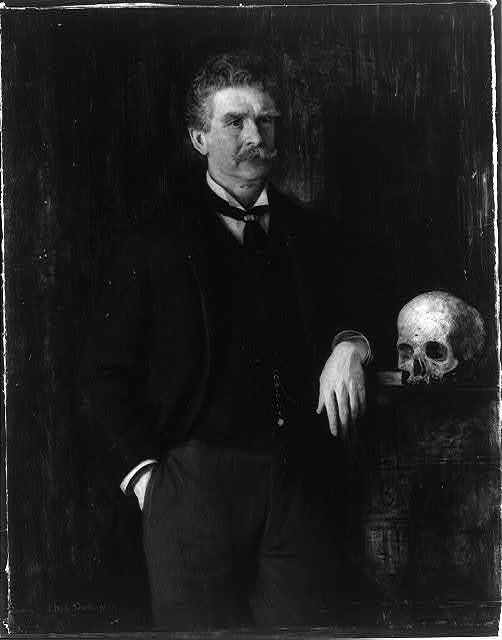 Bierce’s “death” was as elusive as the man himself. An Occurrence at Owl Creek Bridge and Other Stories by Ambrose Bierce is available at the Indiana Historical Bureau book shop. Visit Part Two to learn about Bierce’s connection to 19th-century freethought.